In this distinct new introduction to the field, one of the world's most respected and experienced philosophers, Pascal Engel, voices his expert view on the state of the field, including the relationship between our common sense understanding of the mind and its scientific study, the idea that there are distinct levels of explanation and the nature of mental representation. It also attempts to show how philosophy and psychology can be articulated in a variety of cases - the nature of mental representation, of concepts, of perception and action, rationality and the social nature of cognition - leading to a fruitful combination of empirical and conceptual approaches to the mind. This concise yet authoritative volume offers the advanced student or philosopher both an overview of the subject as it is today and a modern interpretation of the field from a respected philosopher. 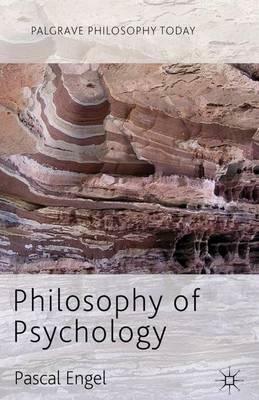 Pascal Engel offers something unique to the reader by examining philosophy of psychology within the context of philosophy of science and philosophy of mind. Furthermore, he invites the reader to explore issues in social psychology and the future of the field. Psychological Explanation The Aims and Scope of Cognitive Psychology The Normative Mind and the Causal Mind Is Knowledge a Natural Kind? Should Psychology go Social? PASCAL ENGEL is Professor of Contemporary Philosophy at the University of Geneva, Switzerland. He is the author of The Norm of Truth (1991), Ramsey, Truth and Success (with J. Dokic 2001), Truth (2002) and of many publications in philosophy of language, philosophy of mind and epistemology.